Do employers have to do anything differently? 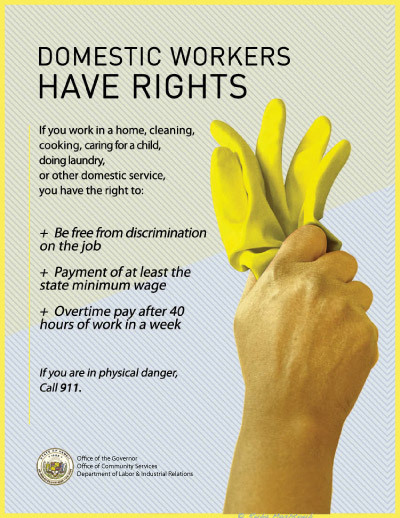 As of July 1, 2013, if you employ domestic service workers in your home you must pay them minimum wage and overtime after forty hours a week. This applies to “live-in” domestic service workers and those who work in your home but return to their residence at night. The new requirement to pay minimum wage and overtime to domestic workers you employ in your home does not apply to “casual” domestic workers, companionship workers, or babysitters, unless babysitting is their vocation. Casual domestic service workers work intermittently and irregularly and do not work more than twenty hours a week. After January 1, 2014, all employees should see a change in their pay statement that provides information about their paycheck and the amount of wages being paid. The employer’s name and address should be on the pay stub along with hours you worked and the rate of pay you received. Note: Some pay stubs may already be in compliance with the new law. 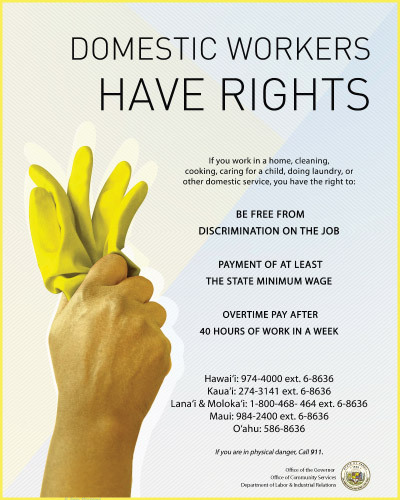 If you are a domestic service worker, you are eligible to receive minimum wage ($7.25) for all hours worked and overtime (1-1/2 of your regular rate) after 40 hours a week under the Hawaii Minimum Wage and Hour Law. If you are not receiving minimum wage or overtime for work you performed after 40 hours a week, please contact the Wage Standards Division to file a complaint at dlir.wages@hawaii.gov or 808-586-8777. OCS, by law, provides human service programs for Hawaii’s economically disadvantaged, immigrants, and refugees. OCS contracts a wide array of services to non-profits serving these populations. Beginning July 1, 2013, OCS launched IRCs in four locations across the State, with recent immigrants (including “COFA” migrants) as their target populations. These centers serve as “multicultural navigators” that connect newcomers to the resources, services, and opportunities that they need to fully participate in the economic, civic, social and cultural life of the Hawaii community. The centers are staffed by bilingual or multilingual outreach workers and case managers. IRC services include, but are not limited to, outreach, intake, assessment/case management, supportive counseling, information and referral services, and formal acculturation programs. In our view, the target populations of the IRCs substantially overlap with the target population of the Domestic Workers right law, defined as individuals who perform domestic work in or for a household or households, whose demographics are largely (1) women and girls from (2) developing countries and (3) disadvantaged communities, many of whom are (4) Limited English Proficient (LEP), and some of whom are (5) undocumented immigrants. The goals of the Domestic Workers Rights law and our IRC objectives are congruent: The law’s goal is to promote and protect the human rights of domestic workers, while the IRCs work toward increasing awareness of this target population about their rights, including many other statutory protections, such as wages and hours laws, OSHA, access to health care, resources in domestic violence, and sexual assault situations, human trafficking issues, and other related issues. OCS and its IRC service providers recognize that this target population is particularly vulnerable to discrimination and exploitation with respect to conditions of employment and human rights violations. OCS and its IRC service providers also recognize the importance of educating domestic workers about their rights and the general public as well as a preventive measure. The IRCs employ bilingual and multi-lingual staff who have been carefully selected for their abilities to provide culturally and linguistically appropriate and effective outreach and public information.